When I was growing up, it was always a tradition in my house to bake cookies in the weeks leading up to Christmas. My mom isn’t much of a baker but my sister and I would spend many hours making dough and then cutting out and decorating cookies. Usually we would make plain old sugar cookies and decorate them with green, red and white icing. 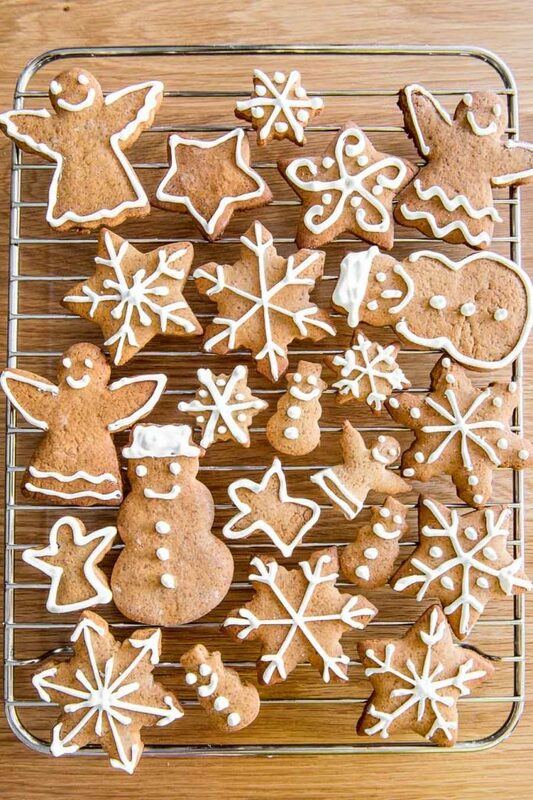 It was only in my twenties that I discovered this absolutely delicious Gingerbread Biscuit recipe, and it has been the preferred Christmas cookie ever since! There is just something so Christmassy about the aroma of cinnamon and ginger in the kitchen. This gingerbread has the perfect amount of spice, and a lovely crisp but slightly soft texture, just how gingerbread should be. 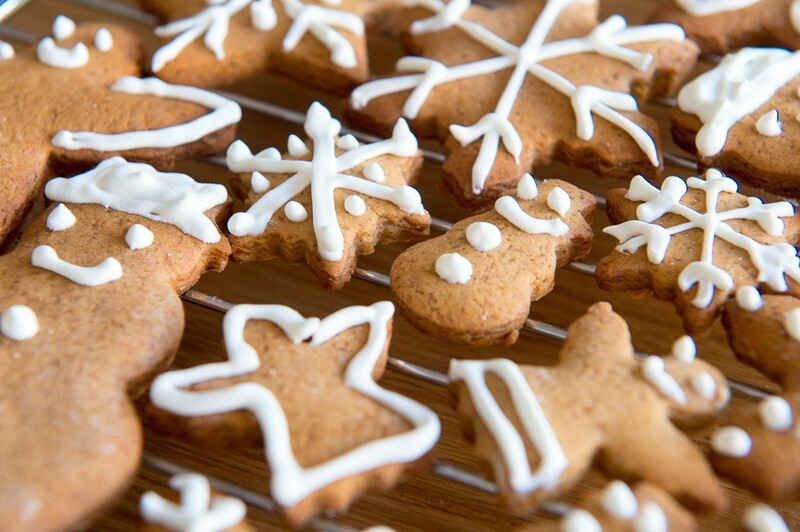 Royal icing and gingerbread are firm friends – not only does the white, glossy icing look striking on the spicy brown biscuits, but it adds just enough sweetness to balance the flavour perfectly. For a Gingerbread centrepiece for your Christmas table, or a fabulous edible gift, why not make these stunning Snowy Gingerbread Trees? Beat the butter and sugar together very well, until light and fluffy. Beat in the syrup, ground spices, baking soda and salt. Add 1 cup of flour at a time, mixing until just combined. The dough will come together but will be rather soft. Do not add more flour or overwork the dough. Divide the dough into 4 flat discs, wrap in clingfilm and refrigerate for 3 hours (the dough can also be frozen for up to 3 months). Preheat the oven to 180°C. Roll out the dough on a floured surface to approximately 0,5cm thick. Cut out cookie shapes and place on a lined baking tray, 2 cm apart as they will spread during baking. Bake for 10-13 minutes, then remove from the tray and allow to cool completely. To make the icing: beat together the egg whites and lemon juice until foamy. Sift in the icing sugar, 1 cup at a time and beat very well for about 5 minutes until you have achieved a smooth and glossy meringue texture. Cover icing with clingfilm until reasy to use. Once the biscuits have cooled completely, use a piping bag fitted with a fine round (writing) nozzle. 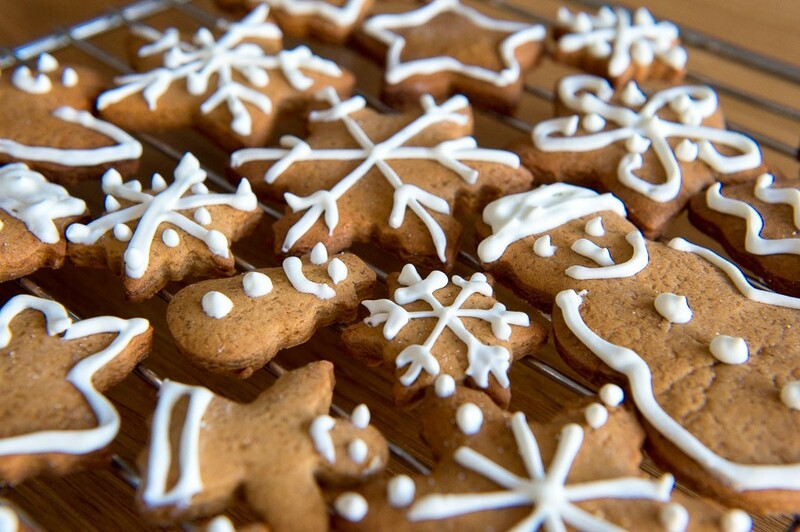 Decorate the biscuits as you wish, and leave them until icing has dried. Store in an airtight container.